The Nintendo Switch is pretty awesome on its own, but it’s even better when you enhance your gaming experience with great accessories. Of course, that doesn’t have to mean spending a lot of money if you know where to look. In this post, we’ll show you five awesome Switch accessories that cost less than $20 each. 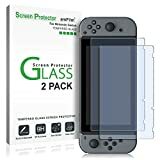 From $8 screen protectors and a great $11 carrying case to a little adapter that will double your Switch’s data speeds, we’ve got all the bases covered. 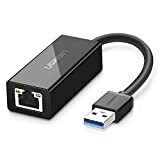 Check out all of these Switch accessories below. HIGH QUALITY CASE – High Quality Durable hard shell Protect your Nintendo Switch Console free from scratches. 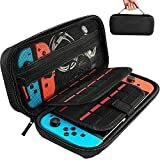 A Velcro secures the Nintendo Switch inside the case (We have replaced two elastic straps with a Velcro,It is a lot easier to put in and take out the Switch with a Velcro), make your switch more stable and convenient when you’re traveling or not using. UNIQUE ZIPPER HEAD DESIGN – We use High Quality Nylon Zipper Head, not like the other Nintendo Switch case’s Iron Zipper Head will scratch your precious switch（We show this contrast in the 5th picture）. Zipper ensures your small items do not fall out. 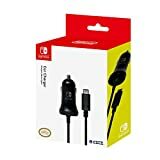 LARGE STORAGE – A large zippered mesh pocket provides secure storage room for some small Nintendo Switch accessories like small Charger, charging cable, slim power bank, ear buds, and 2 extra Joy-Cons, Easier to Close and Easier to Carry. It also build with 20 game card slots, allowing you to carry and change your favorite games anytime & anywhere. 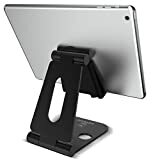 【UNIVERSAL COMPATIBILITY】 Tablet stand work with all 4 – 10-Inch smartphones and e-readers, such as Nintendo Switch, iphone 6 / 6s / 7 / 7 plus, Galaxy S8 / S7 / S6 / Note6, LG,Motorola, HTC, IPAD mini / pro / Air / Air 2, Samsung Tab, Google Nexus, Kindle, even in protect case. 【MULTI-ANGLE & POCKET-SIZE】 Stand for Nintendo Switch can be adjusted to your desired angle (270 degree) with your hand. Foldable design make it possible to be shrank to pocket-size, which is easy to carry. 【STURDY CONSTRUCTION& RUBBER PADS】 Durable aluminum body, with a sturdy construction, can hold your phone steadily. Rubber pads and feet protect your device from scratches and sliding. 【SMART LIFESTYLE】 Hands-free, make iPad stand possible to play games, use Facetime and Youtube while charging. Play a good role in your office, kitchen, nightstand, dining table. 【LIFETIME GUARANTEE】 If you are not satisfied with it. Please feel free to contact us, we will offer you a FULL REFUND or new REPLACEMENT.